"This informal pie is baked on a sheet pan and serves a crowd! Use frozen berries for a fresh flavor any time of year. You may serve this with whipped cream or ice cream, if desired." Lightly dust an 11x15-inch half-sheet pan with flour. Carefully place the 2 pie crusts into the bottom of the sheet pan, gently stretching and trimming the crusts to fit the bottom and up the sides of the pan. Combine berries, sugar, arrowroot powder, and salt in a large bowl; stir well. Combine oats, flour, brown sugar, apple pie spice, and salt in a medium bowl. Use a pastry knife to cut butter into the oat mixture until butter is evenly distributed throughout and the crumble topping mixture resembles small, uneven pieces. 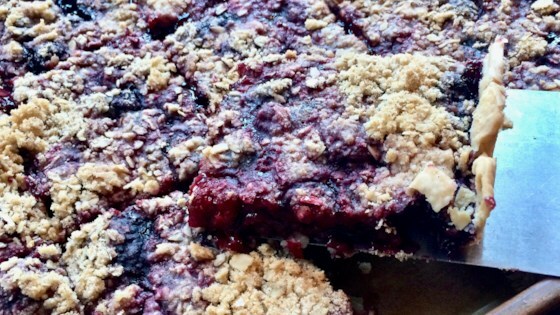 Pour berry mixture evenly onto the crust and add crumble mixture on top. Apple pie baked in a rectangular pan with a crumble topping.